Got Mods? A Grille Badge will improve the look of your Cooper, Cooper S, Cooper Cabrio, JCW, MINI GP, or Clubman and let you make a statement at the same time. Specific instructions are included for the above vehicles, but virtually any vehicle will accept our grille badge holder. The padded front plate compresses the grille between itself and the back plate allowing it to work anywhere. The holder stays in place, without harming your vehicle. We even include sleeves for the screws to protect your paint. Once you have your badge holder in place, you can stick any badge there any time. 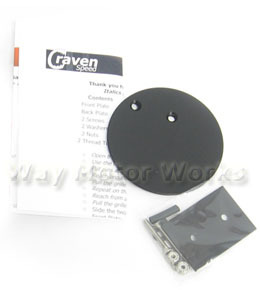 There are tons of magnetic and sticker badges available to fit this 3 inch size holder.